1. Hey, locals! Check out Ric's kind posting below! 2. Dan Holmes Production Band, featuring, uh, Dan and our own Karry Wenger, is providing a Toys for Tots Benefit Concert at the Belvidere Community Building on Sunday, December 14 at 7:30 p.m. Fun, fellowship, entertainment, and an opportunity to honor the reason for the season by bringing an unwrapped new toy for a child. 3. People keep asking me, "What is Presbyterian Elders in Prayer all about?" Quick answer: "More than I can ever explain!" Short answer: "PEP knows we have exhausted all of the wrong answers in addressing our world's problems, America's increasing decline, and the spiritual confusion(s) in sooooooo many of today's churches bringing out the worst of Matthew 15 and 23. PEP knows the answers begin on our knees!" For more background information, go to www.presbypray.org and make sure you're signed up for PEP Talks by e-mail and the quarterly newsletter by snail mail. If you wanna sign up, just click on kmac@belvpresbyterian.org and, uh, sign up! 4. Speaking of PEP, don't miss the inaugural "Add a Little PEP" featuring Joe Pallikkathayil commencing live on Friday, December 6 from 11:15 - 11:30 a.m. on www.bnnsradio.com. Just click on www.bnnsradio.com at 11:14!!! 5. Speaking of PEP, Mountaintop Cell(ular) Ministry continues this Wednesday, December 4 from noon to 3:00 p.m. Sooooooo send in those praises, petitions, and supplications to kmac@belvpresbyterian.org or call 'em in via the shared prayer line (815-544-3535) by Tuesday. 6. Back to the locals, all Midweek ministries resume this Wednesday, December 4! Read your bulletin or go to www.belvpresbyterian.org for more exciting news and opportunities! 7. 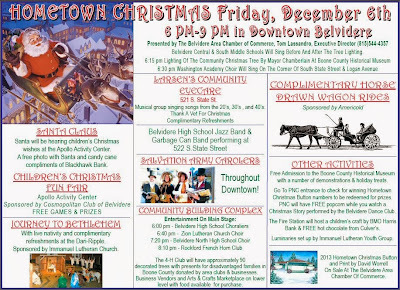 BTW, you don't want to miss the "Journey to Bethlehem" advertised below! It's really great faithful fun; especially for children! My brother Rus, who was mentioned big time during last Sunday's worship services, often hosted such journeys while a pastor in Pennsylvania. BTW, always remember/share/forward His-not-our table of His Holy Communion is not fenced at First and no one who loves Jesus or wants to love Jesus is ever turned away or fenced/denied/rejected. People are hungry and thirsty for the real deal by the book. Sooooooo invite, welcome, include, and agape! 9. If you did miss it/Him, the revival accelerates every Sunday on the corner of Lincoln and Main! Rebirths! Renewals! Recruits! Awesome!! !